Parents will be pleased that while their children enjoy this G-rated live action adaptation of the classic fairy tale, they will find themselves entertained, as well — and even laughing out loud in a couple of spots. 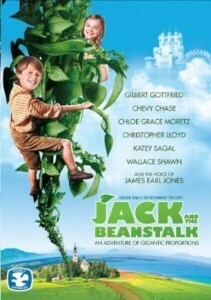 Apparently taking a cue from the Harry Potter franchise, Jack and the Beanstalk finds Jack (Colin Ford, TV’s Supernatural) enrolled in fairy school, where he has a bad reputation due to his father who disappeared years ago. Assigned to perform a heroic deed over the weekend, Jack sells his Computer of Wonder (“c-o-w” – get it?) for a — you guessed it — handful of beans. The world he enters into after climbing the stalk (along with a funny Gilbert Gottfried of Aladdin as his duck-turned-human sidekick) is a dangerous one, but he is helped along by young Jillian (Chloe Moretz, Let Me In), who performs an amazing martial arts scene that every kid or adult will cheer. For a low-key and low budget film, Jack looks great — kind of like a Princess Bride for young kids, full of charming and just-scary-enough monsters and animals. Other faces that the adults will recognize include Chevy Chase (Caddyshack), Wallace Shawn (TV’s Crossing Jordan), Katey Sagal (TV’s Sons of Anarchy), Christopher Lloyd (Back to the Future) and James Earl Jones (The Lion King) as the voice of The Giant. A solid family movie, Jack and the Beanstalk was awarded the Dove Seal of Approval and the Parents Television Council Seal of Approval.